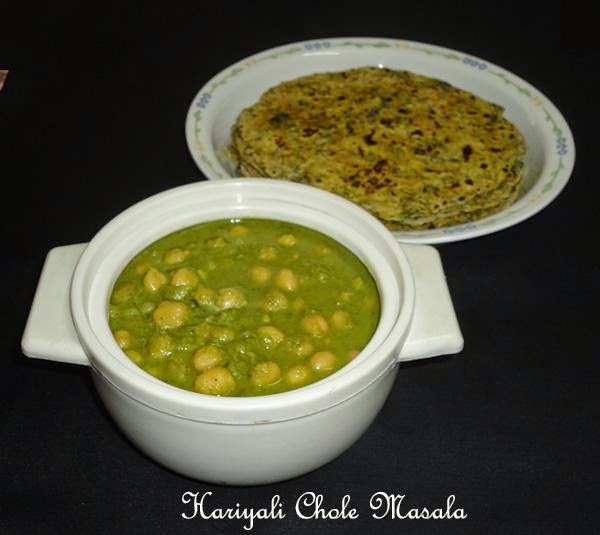 Hariyali chole masala recipe - Today I am going to share a delicious hariyali chole masala recipe which goes great with parathas, theplas, phulka, roti, pulao or even rice. This is an easy to prepare side dish which I make often and very different from the usual chana masala. This hariyali chole masala is a delicious combination of kabuli chana, green corianders and fresh coconut. We enjoyed it with hot methi theplas along with crisp papads, curd and mango pickle. This recipe is a mix of both South Indian and North Indian style. The combination of coconut with chickpeas is particularly South Indian, while the use of coriander leaves and spice powder is very North Indian. In India, chickpeas are one of the most important and popular legumes used to prepare various dishes like kadbuli chana masala, punjabi chole, chana usal, chana curry, salads and so on. Chickpeas add unique flavor to the dish and it also contains ample amount of proteins. To add protein in your dish, use kabuli chana or small variety of brown chana in combination with any other legumes and vegetables. Roasted chana is also a healthy snack and kids love it for sure. 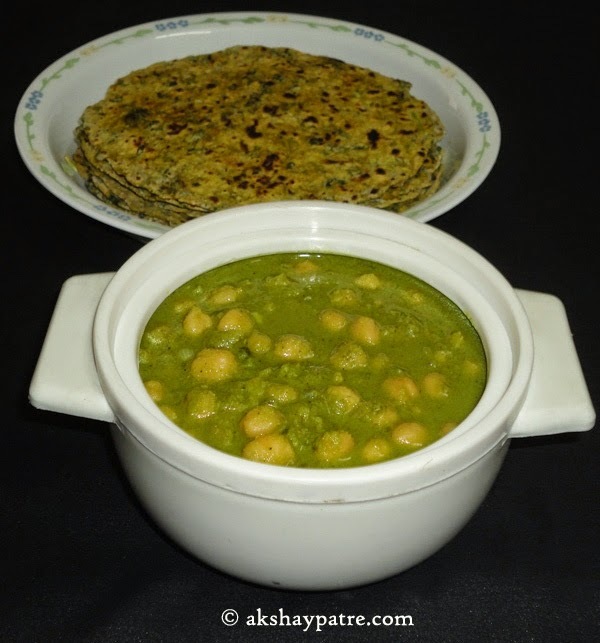 Previously I had shared kabuli chana masala and chana usal recipes which are great side dish for Indian flat breads. Wash and soak the kabuli chana with enough water. Soak it for 7 - 8 hours. Drain the water, add enough water and pressure cook till 5 - 6 whistles and then on low flame for 5 -6 minutes. Once the pressure releases, remove and mash few chanas with a spoon and keep it aside. Mix all the ingredients mentioned under " Grind to paste" together and grind it to a smooth paste, using very little water. Heat the oil in a pan. Add the curry leaves and onions. Fry till the onion becomes translucent. Add the ground masala and saute for 5 minutes. Then add the garam masala, haldi powder, coriander powder, jeera powder, chilly powder and stir for 1 minute. 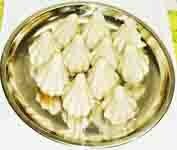 Add the boiled kabuli chana along with water. Add required water to get the desired consistency. Add the salt and bring it to boil, then simmer on low flame for 4 - 5 minutes. Remove from the flame. Squeeze the lime in it and mix well. Serve hariyali chole masala hot with paratha, thepla, phulka, roti, chapati, pulao or even rice. Thanks for your lovely comment beena. Hariyali chole masala looks delicious.. bookmarked!! Thanks a lot Sona, Try it and let me know how it tastes. Wat a beautiful channa masala, love to have with some rotis. Thank you very much Priya. I happened to come across this recipe yesterday and had a bowl full of cooked kabuli chana in the refrigerator, left over from the hummus I made earlier. I made it today and my family loved it a lot. We ate it with left over pita bread, delicious! Thanks! Nagashree, thank for trying this recipe and for the feed back. I never try this hariyali chole, it looks delicious. Thanks for recipe.